Following the lead of local experts (the gas-station guy, Little Leaguers), writer Peter Kaminsky goes in search of great North Carolina BBQ. While traveling through North Carolina to research my new book, Pig Perfect, I ate barbecue at least once a day. And, for four days last year, I ate it at almost every meal on a 250-mile, high-intensity barbecue tour. Since my starting point was Lexington, in the middle of the state, and my destination was a fishing lodge on the Outer Banks, I have come to think of this dining excursion as my barbecue march to the sea. (c) there were a lot of trucks filling the parking lot and spilling out onto the road. Following the will-'o-the-wisp in this fashion rather than planning every stop is an appealingly unstructured way to enjoy the rich and rolling landscape, where the hill country descends to the fertile plains of the lowlands and their fields of picked-over cotton and red barns stuffed with ripening tobacco. The vista is an old-time onemuch of it still unmalled and unfranchised and tantalizingly redolent of the aroma of barbecue, without which local elections, high school football games, weddings, graduations and firehouse picnics would be unthinkable...or, at least, not nearly so much fun. In the center of the Piedmont, the plateau between the Blue Ridge Mountains and the coastal plains, Jimmy's is a pleasant knotty-pine room decorated with pictures of high school football champions, stock-car heroes and smiling family members. It still looks somewhat like a drive-in restaurant from the 1950s, which is what it was until the late Jimmy Harveywho spent 28 years apprenticing in the businesstook it over in 1977; now his wife, Betty, and sons Terry and Kemp run the show. Jimmy's is among the easternmost outposts of western-style North Carolina barbecue, which typically adds tomato or ketchup to the peppery, vinegary sauce. (In the east they leave the tomatoes out.) East and west look upon each other the way devout believers regard idolaters. I'm more ecumenical when it comes to sauces. I like them all. I went for Jimmy's sliced barbecue, which requires a gentle carving touch to keep the tender meat intact. With its crisp skin, and, just underneath, the telltale smoke ring and dark flesh or "outside brown" of slow-cooked barbecue, the pork was wonderfully succulent. Crisp cornmeal hush puppies on the side and coleslaw with a peppery red dressing contributed crunch and heat to the meal. The flavors were so savory that the extremely sweet iced tea didn't even wake up my fillings. 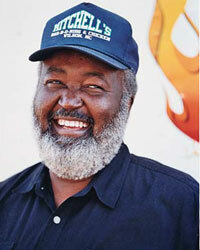 Before visiting North Carolina, I'd already met Eddie Mitchell at a "barbecue summit" convoked by the Southern Foodways Alliance. The beat of Mitchell wielding two axes to chop his barbecue had proved a strong lure for aficionados, who cheerfully lined up in the rain for his quintessential eastern Carolina barbecue: whole hog, slow-roasted and drenched with a bracingly spicy sauce. Of course, when I asked the ebullient Mitchell for the recipe he said, "I can't tell you." Why barbecuers are this way about their sauces is a mystery to me. Barbecue sauces are usually made with the simplest ingredients, but the recipes are as closely guarded as the formula for Coca-Cola. The secretiveness must be a Southern guy thingthe same way you don't tell people about your fishing holes or duck blinds. But the real secret to Mitchell's success isn't a mystery at all, as I found when I visited him. "We bank the fires," he says. With banking you typically use a bag or two of charcoal to make a fire in a cement-block pit that is set into sand (Mitchell uses a mix of hickory wood, oak wood and charcoal). Instead of constantly poking, prodding and fussing with the meat, you simply put a pig in, tamp down the fire and return six hours later to turn the hog. And remember to throw a little salt on when you turn him. That's the whole deal. Most heartening to me, having spent the last few years championing naturally raised pork, Mitchell is now serving antibiotic-free meat from local farmers. For special events Mitchell also sets up a "pig-pickin' bar" in the dining room. Intended to be the barbecue lover's version of an oyster bar, it has traditional but oddball items such as pickled pig's feet, souse (a vinegary gelatin-and-pig-ear recipe) and chitlins. Dominating the room is a wraparound mural of a "pig pickin'," a get-together that once marked the end of the tobacco harvest. Like that time-honored feast, Mitchell's menu includes much more than barbecuesuch as macaroni and cheese, collard greens, candied yams, coleslaw, hush puppies, Brunswick stew and a scrumptious Mitchell family delicacy, fried fruit jacks (think of an egg roll filled with fruit or sweet potato). Whoever said you can't eat atmosphere never sat at one of the red picnic tables in the parking lot of B's, inhaling the fragrant blue smoke that wafts from the screened-in barbecue pits. From its white brick front with the vintage Coca-Cola sign to its lack of both phone and Web site, B's Barbecue is sweetly old-fashioned, and I suspect it was that way from the day that William "B" McLawhorn opened for business in 1978. For the barbecue pilgrim, the row of trucks parked off to one side of B's Barbecue Road and the line of barbecue lovers that forms at B's takeout window every morning at 11 o'clock are inspiring. But be warned: When the day's batch of barbecue has sold out, you'll have to wait until tomorrow for more. B's whole-hog barbecue is chopped, then dousedif my palate is accuratewith a sauce made with vinegar, salt, black and white pepper, and white sugar. It's hard to miss when combining such elemental tastes; in fact it has been my experience that you can always mix sweet, sour, salty and hot to good effect. Although the replica of the U.S. Capitol dome atop the Skylight Inn could hold, at best, four very slim senators, it nonetheless serves as a beacon over the flatlands of the coastal plain, drawing barbecue fans to the Skylight's traditional barbecue. Here, as in what seems like every barbecue place in the eastern part of the state, everything is underscored by the continuous muffled thump-thump of cleavers chopping through hunks of pork that sit atop a well-worn chopping block. Original proprietor Pete Jones liked to trace his barbecue lineage back to 1811, the birthdate of his great-great-grandfather, who, it is recorded, served slow-cooked, smoked and sauced whole hog, chopped to a fine mince. Jones passed away a year ago, but his son Bruce and nephew Jeff have kept true to his barbecuing philosophy and use hardwood only (no electricity, no charcoal) in their pits. Smoke from the cords of oak consumed here fills a good part of Pitt County with the porky perfume of barbecue. True to its heritage, the Skylight leaves lots of crunchy crackling bits in with the meat in recognition of the fact that a little fat always goes a long way toward producing great flavor. Even for a barbecue fanatic, there's a limit. By the time I hit the coast I'd reached mine, but at least I could keep the faith with another longtime favorite, deep-fried North Carolina shrimp. At Capt. Bill's, I always order the shrimp burger, which is nothing more than "lots of fried shrimp mounded up on a bun," as a friendly waitress informed me. Enjoying such crisp-fried, briny fresh shrimp is an uncomplicated alternative to the nuances of barbecue, but whichever you choose, both of these down-home foods are best eaten where they come from. And to do that, you'll just have to pick up and go there.